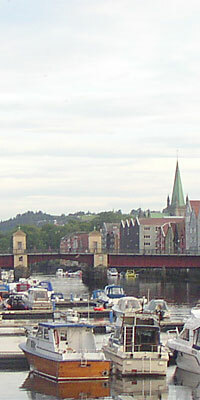 Trondheim is the main city of mid-Norway and a major university town - most of Norway's top engineers graduate here. It was a royal town until 1217 and like most other Norwegian towns it has had a long history of major fires, with the 1681 fire leading to the total reconstruction of the city, with wide streets (to control fires). In 1930 the old name of Nidaros was reimposed, causing unrest and riots, so it reverted to Trondheim. The cathedral is still called Nidaros however. The city sees many cruise ships in the summer season, and the Hurtigruten Norwegian Coastal Voyage ships pass through each way every day of the year. The cruise ship and Hurtigruten terminals are the least attractive part of town (unusually, for Norway) so get past them and the ugly railway yards and discover a truly lovely city beyond. There are several good museums in the Trondheim area, and the Cathedral (Nidarosdomen) Munkholmen island, DORA 1 WW2 submarine base, Kristiansten fortress, Stiftsgården royal residence, and Nordre gate shopping are all popular. Solsiden has lots of nice restaurants and bars, and there are many other good places if you follow the river upstream, or wander through the town.